Over the past decade, it is clear to see that there has been an increase in use for mobile apps. 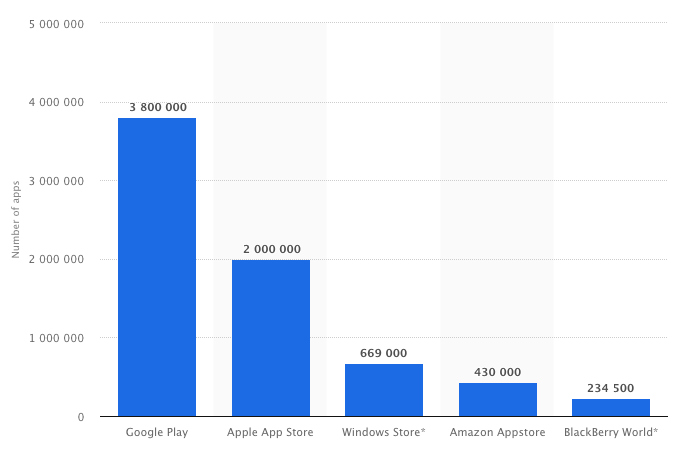 Statistics show that there were 3.8 million available apps from Google Play and 2 million apps available for download in Apple’s App Store during the first quarter of 2018. Other statistics show that the global mobile population amounted to 3.7 billion unique users according to data collected in January 2018. It has also been noted that approximately 197 billion apps were downloaded on mobile devices in 2017. Still not convinced? Click here for more mobile app statistics. As we can see, the use of mobile applications is increasing and there seems to be no sign of this slowing down. Many companies within different industries are realising the positive effects having a mobile app can have. The public sector is one area that is realising the potential of mobile, specifically in the healthcare and education sectors. In terms of statistics, there are currently over 300,000 health apps worldwide with more than 200 new apps being added every day. There are also more than 300 different consumer health devices including fitness trackers that send all information wirelessly to their connecting mobile apps. In April 2017, the NHS Apps Library was released allowing the user to educate themselves further whilst providing support and keeping a record of their condition. A great example of how mobile apps can help in these situations was shown in a trial conducted by East Lancashire Hospital NHS Trust. Data was collected from patients with chronic obstructive pulmonary disease (COPD) at home via digital monitoring which was then sent to clinicians. By doing this, there was a significant reduction in admissions, lengths of hospital stay and reduction in home visits. Other illnesses or prescription taking can also be tracked via a mobile app. The NHS are releasing an app at the end of 2018 allowing you to book GP appointments, order repeat prescriptions and access the 111 helpline. This will help to speed up the process of booking appointments and having to wait for diagnostics. Another benefit of using mobile apps within healthcare is a reduction in costs for those who pay for their healthcare. If a mobile app is tracking your health and you are able to see that it is deteriorating, you are able to go to a GP before having to stay in a hospital resulting in a positive cost benefit to the NHS service. In terms of education, mobile apps are ideal for providing ease and accessibility to students, parents and teachers in a number of ways. These apps can improve a student’s learning by introducing them to new methods through games and interactivity as well as allowing parents to see their child’s progress. Using this method of learning allows students to learn without having to purchase multiple, bulky textbooks as all of their required resources will be available via the app. This also means that all of this information is accessible to them 24/7. Many global companies like Google, Microsoft and Sony are entering into the education industry to provide easy learning solutions for students. Statistics show that more than 5.5% of education revenues are now spent on technology for education. As well as this, 99% of m-learners believe that having a mobile format and presentation enhanced their learning. What Can Channel Tools Do? Channel Tools have great experience in building public sector apps. With our mobile knowledge, we deliver mobile projects for businesses to provide an increase in ROI, improved efficiencies and helping them to get closer to the citizen. Our Integrit mobile engagement platform perfectly suits healthcare organisations as it can work as a staff and/or patient assistant. We provide many features and so are able to integrate asset tracking and wayfinding technologies whilst letting patients gain access to relevant care and support documents. In terms of education, the Integrit platform is ideal as there are many features that can be integrated to work well for students, teachers and parents. Resources which can reduce the need for textbooks. Presentations that are made available for students in case of missed classes or lectures. Feedback allows students to ask a question or ask for further information. Push notifications allows you to send reminders for parent’s evenings or let the user know of any snow days. Book a meeting between teachers and students for parents evening. Promotions can be altered to be used as a place to show the costs of uniforms. Forms to allow parents to sign the children up for school trips. All Integrit solutions are completely tailored to the needs of the client and can be provided with full maintenance and support options. We are here to help you take control of your move to mobile. If you are interested in finding out more information please contact us by calling us on +44 (0)1923 299629 or email us at info@channel-tools.biz.